Panini Marvel Trading Cards . Box of 36 (sealed) New. Condition is New. Dispatched with Royal Mail 2nd Class. 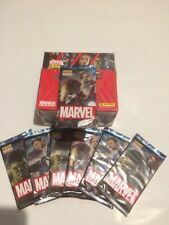 Panini Marvel Trading Cards .7 Sealed Packs . New. Condition is New. Dispatched with Royal Mail 2nd Class Large Letter. 1 X BINDER & INDEX COVERS. 1 X 1-16 RAINBOW FOIL CARD SET. 1 X 17-48 MIRROR CARD SET. 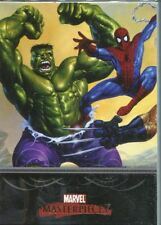 Hero Attax Marvel Cinematic Universe cards Hulk and Cap. Condition is Used. Dispatched with Royal Mail 1st Class. Panini Marvel Trading Cards . X2 Box of 36 (sealed) New. Condition is New. Dispatched with Royal Mail 2nd Class. THE WINTER SOLDIER. THE CARD IN THE TITLE & PICTURE IS THE CARD YOU WILL RECEIVE. 1 LTD GROOT. 1 LTD GAMORA. 1 LTD STAR-LORD. 1-224 FULL REGULAR CARD SET. 225-240 MIRROR FOIL SET. Perfect for any superhero fan, would make for a great party prop. X9 regular cards. x1 holographic/mirror card. 1 X 17-32 AVENGERS HOLO FOIL SET. 1 X LEC LTD CARD. BOXES FOR DISPLAY ONLY. 1 X 1-16 HOLO FOIL CARD SET. 1 X 159-176 PUZZLE CARD SET. Base #10 Rhino #1767/1999. Base #12 Absorbing Man #0437/1999. Base #12 Absorbing Man #0028/1999. Base #26 Hercules #1477/1999. Base #27 Morbius #1008/1999. Base #53 Falcon #0211/1499. Base #58 Professor X #0431/1499. TOPPS MARVEL HERO ATTAX 2010 FULL 200 CARD SET 1 LTD & THOR & C.AMERICA SETS. 1 X T1-T15 THOR CARD SET. 1 X 41-100 REGULAR HERO CARD SET. 1 X 17-40 FOIL CARD SET. LE2 3 4 and 5. All cards are mint condition went straight from packet to folder and have remained there. Will be posted in thick cardboard to prevent damage. These cards were produced by Upper Deck, look fantastic and would make a great addition to anyones collection - Card is in great condition. hero attax marvel cinematic universe - Mostly Complete. Condition is Used. Dispatched with Royal Mail 2nd Class. 1 X H1-H5 HOLOGRAM FOIL CARD SET. 1 X 1-200 CARD SET. 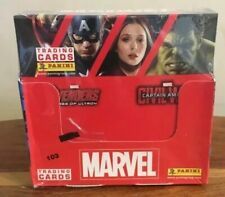 Captain America Civil War Topps Hero Attax Card Bundle. Condition is New. Dispatched with Royal Mail 2nd Class Letter. Marvel Thor Ragnarok Trading Card. Card released by Upper Deck in 2018. THE FIRST AVENGER. THE CARD IN THE TITLE & PICTURE IS THE CARD YOU WILL RECEIVE. Marvel Masterpiece 1994 gold foil signature Hilderbrandt Bro 15 cards All in good condition except Card 4 Bishop has slight edge damage. Card numbers 1, 4, 11, 20, 40, 47, 53, 57, 73, 74, 80, 81, 92, 93, 97. Please allow a few days for delivery as I normally post on a Saturday. Thank you for looking. Job Lot 16 Topps Marvel Cinematic Universe Trading Cards. Here for sale is a Job Lot 16 Topps Marvel Cinematic Universe Trading Cards. All cards are in excellent condition, from the Marvel MCU Topps collection. 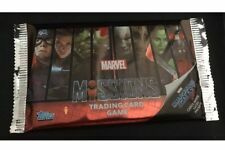 Marvel Avengers Topps Attax Trading Cards with TIN, Infinity & Civil War Endgame. Condition is as New. This tin & the cards inside are from one of hubby's subscription boxes - Nerd Block, Geek Box, Loot Crate etc. In as new condition as has just sat on a shelf. I aim to despatch within 2 working days after payment, and I am happy to combine postage with my other items to reduce postage costs. Just message and let me know before paying, so I can send a revised invoice. UK buyers only please and no cheques. Thanks for looking! In circulated condition, see photos they are scans of the card. Card was pulled from one of the rare DS Dyson Chase Cards. These cards were produced by Upper Deck, are in great condition and were pulled by myself. Marvel Black Panther Trading Card. Sketch card released by Upper Deck in 2018.